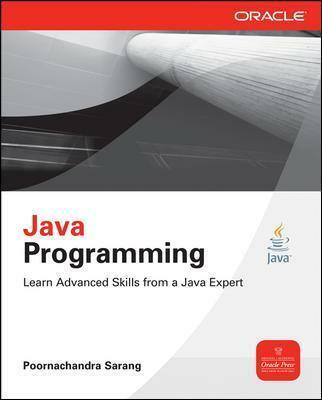 Develop, Compile, and Debug High-Performance Java ApplicationsTake your Java skills to the next level using the expert programming techniques contained in this Oracle Press guide. Featuring real-world code samples and detailed instructions, Java Programming demonstrates how to fully utilize the powerful features of Java SE 7. Find out how to design multithreaded and network applications, integrate structured exception handling, use Java libraries, and develop Swing-based GUIs and applets. Inheritance, generics, and utility classes are are covered in this practical resource. Poornachandra Sarang is a veteran Java programmer since Java's 1996 inception. During the last 15 years, Dr. Sarang conducted many train-the-trainer programs, instructor authorization tests, and corporate trainings based on Sun Microsystems' official curriculum. He has authored several books and journal articles on Java and various other allied topics. Dr. Sarang has been a regular speaker at many international conferences, including the recent JavaOne 2011. He is also associated with the University of Mumbai and a few other universities of repute as a visiting/adjunct faculty and Ph.D. advisor in Computer Science. Dr. Sarang is invited to deliver keynotes and technical talks in many international research and technology conferences. Besides Java coding, Dr. Sarang does some architecture work and is also well recognized in Enterprise Architecture space.